I first encountered this game at the Gathering of Friends back in April 2016 – we found Friedemann just after he had finished breakfast, and as usual, he had a box of his new games with him. He gave us the elevator pitch of the game – it’s a card game where you collect stuff, and it has a legacy-like component to it… As Friedemann is in my mind one of the masters of game design – as he is able to incorporate many different types of mechanisms in his games – I was intrigued to say the least. So how does it work? Well, let me start from the end. As the story goes, you’re animals in the forest and you’re collecting fruits to make fabled juices. 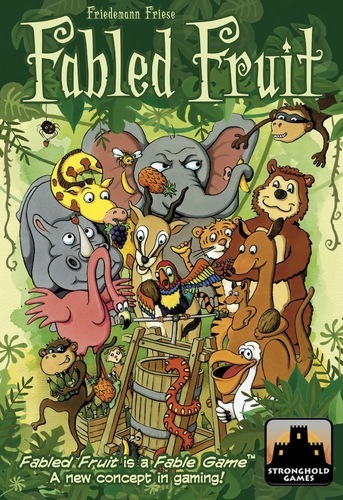 The jungle (or game tableau) is a number of stacks of cards – initially 6 stacks of 4 cards each. At the very bottom of each of these cards is a recipe for juice. If you are able to collect the fruits that match the recipe on the card, you collect the card to represent the fabled juice. OK, so back to setup. The tableau starts as 6 piles of 4 location cards. There are 60 total locations in the game, so there are 240 location cards total. Be sure to NOT shuffle the cards when you get the game. They are all in order already, and it is best to leave them in order. 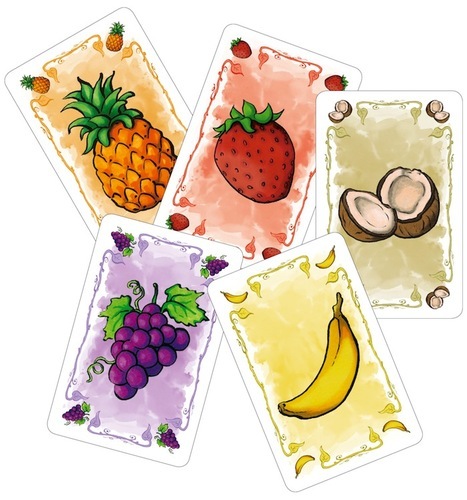 There is second deck of cards, the fruit cards; 12 each of the 5 different types of fruits. Each player is dealt two randomly, and the rest are placed in a draw pile. Each player chooses an animal meeple; this starts next to him. A first player is chosen, and on each turn, you must move your animal meeple from its current location and onto a new location card. On the first turn, you can place it on any card. If you have moved your piece onto a card which already has other players located on it, you must give one fruit card from your hand facedown to each player already at that location. Then, you can either use the special action printed on the location card OR you can buy the card you landed on provided that you have fruits matching the recipe printed at the bottom. 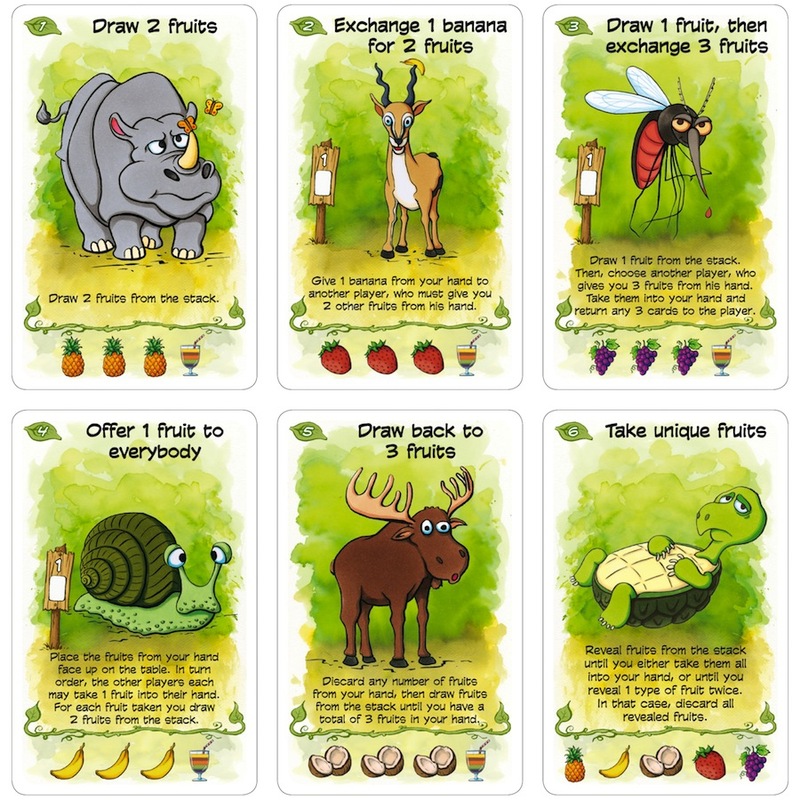 In general, the actions on the cards help you gain more fruit cards or perhaps improve your selection of fruits. As you can see from the picture of these cards; each one also has a specific recipe at the bottom which can be used for purchasing that particular card. You will notice a rainbow colored smoothie on cards 1 to 5. This is a wild fruit and any fruit can be used to fulfill the smoothie in the recipe. The cool part of the game happens once you buy a card. Now, you draw the top card of the location deck. In this example, it will be the first card of the Location 7 cards. As this is a new location, you start a new stack on the table. There will now be seven different actions that can be done. After later buys, you simply stack like cards upon like, and make new stacks when new cards come up. As the location deck is in order, the next 4 cards will all be Location 7, followed by four cards for Location 8, etc… Thus, as your game progresses, the game will slowly evolve. There is no guarantee that games will play alike because players may choose to fulfill different Location cards based on the fruits that they collect. In a 4-player game, the game ends when someone gains their third juice card. The current round is finished so that all players have the same number of turns. If there is a tie for the number of juices, the player with the most remaining fruits is the winner. At this point, you could stop playing and pack the game up… Or you could keep going – and that’s where the awesomeness of the game is. Just keep playing with the current assortment of Location cards; give each player two random fruit cards and play another game. At one point at the Gathering, we had a tableau that had ten different locations represented in the 24 cards on the board. (There will always be 24 locations available in the game…) The game will continue to slowly evolve as you play. If you choose to play multiple games in a session, the rules offer campaign scoring to track your overall success in the session. If you’re done for the night, but you want to keep your place in the game – that’s easy to do as well. The game comes with a number of plastic bags (which I’ll probably end up labeling with a sharpie). Take the current 24 Location cards and collect them in your “Next Game” bag. Whenever you want to start playing again, you have your setup cards all in one place. Take all the scored fabled juice cards from games played this session and put them in a “Finished” bag. You don’t really need to sort them now – that will only be necessary when you get to the point of putting Location #60 in play. Assuming that you have managed to score all of the Location #1 cards by that time, you can reconstruct the deck to loop around again. The rest of the active Location deck can also be stored so that you draw from the current place in that deck. When we played in August, we played a number of games – I think we got up to about Location 18 or 19 over the course of the week. I didn’t play in every one of those games, but I do think that I got to see the actions of all the location cards up to that point. It does seem that Friedemann has put a lot of thought into the organization of the cards. While there is no guarantee that the locations will be collected in order, it is a guarantee that the new cards do come out – and there are some short collections of themed or synergistic Location cards that give each set of games a very different feel. A big part of the game’s appeal to me was discovering the new actions as they were revealed on the Location deck. As such, I will not list off the full list of actions in the game (not to mention I don’t really feel like typing out the other 54 actions) – I also don’t want to spoil the game by reading off what all the actions are in the glossary. In broad terms though, there are sections of the game which deal with a thief and stealing cards. 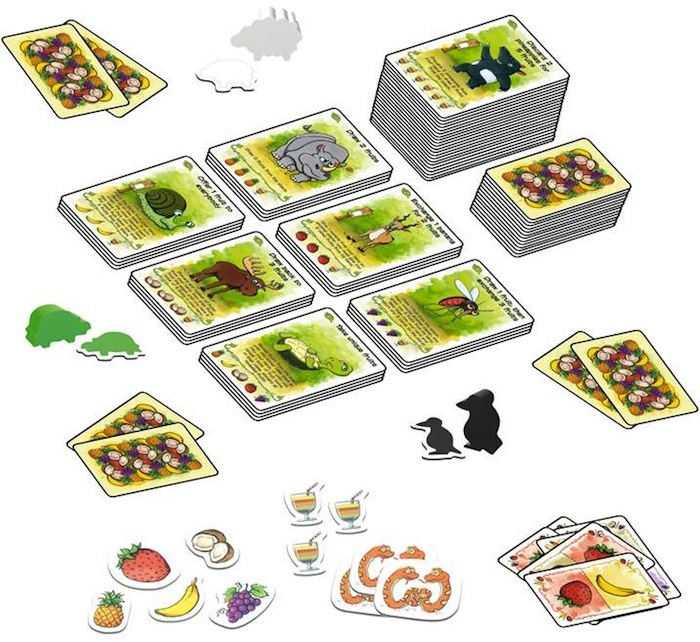 There is also a fruit market that uses ten special fruit-mix cards. There are also cards which give you double turn tokens to use. From my experience with the game, the value of each particular action is at times very dependent on the other actions in play. Figuring out where the synergistic loops are is clearly a big part of the game. Modifying your play to take advantage of the current theme of the tableau is also paramount. I was a big fan of the game from my first few sessions of it, and I am looking forward to the chance to bring this home to my regular group. I can foresee this as a nice regular closer to our weekly sessions where we get in a few games at a time, and over the course of the coming year, we will watch the game change before our eyes. This will be one of the first games that I make sure that I pick up this coming SPIEL fair.